What type of metal are the tips of USB connectors/plugs typically made from? Aluminium? I've noticed they will often, quite-easily, oxidise/rust/corrode. So I'd say stainless steel, some gold plated copper alloy(brass) and flame retardant plastic. Not the answer you're looking for? Browse other questions tagged usb usb-device manufacturing materials metal or ask your own question. Why are the contacts for the Data lines in USB A and B plugs shorter than the contacts for Ground and Power? Down sides/Cons to Dual-Sided USB connectors? 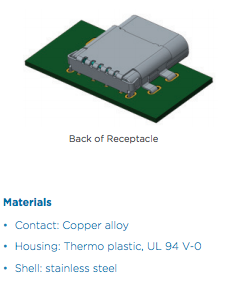 Material Suitable for Self-insulating Solders and Electrical Contacts? What are these incompatible micro usb type B plugs? Are standard USB connectors (Standard / Mini / Micro) Impedance controlled?